"THE ROSARY IS YOUR TREASURE"! 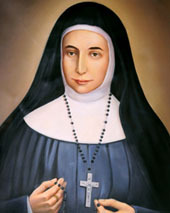 She founded Confraternities and Associations and promoted the devotion to Our Lady and the prayer of the Rosary. She was favored with several apparitions from Our Lady, through which She revealed to Mother Marie Alphonsine Her desire to begin the Congregation of the Rosary, and appointed father Joseph Tannous Yamine as her Director to administer the Congregation of the Rosary. Father Tannous rented a modest house for the five postulants which they entered on 24th July, 1880. Mgr. Vincent Bracco, the Latin Patriarch, vested them in the Holy Habit on 15th December, 1881. Mother Marie Alphonsine went through hard times before she obtained on 12th October, 1880 the dispensation from her vow of obedience to the Superiors of St. Joseph and permission to enter the new Congregation of the Holy Rosary. Father Tannous was always there to help her during those critical times. On 6th October, 1883 she received the Habit of the Rosary Congregation from the hands of Mgr. Pascal Appodia, Patriarchal Vicar. On 7th March, 1885 Mother Marie Alphonsine was admitted together with the first group of 8 Sisters, to profession and pronounced their three vows in a ceremony presided over by Mgr. �THE ROSARY IS YOUR TREASURE�! His Holiness, the late Pope John Paul II, announced the acknowledgement of the heroic virtues of Mother Marie Alphonsine on 15 October, 1994, and in 1995 she was proclaimed �VENERABLE�. The Rosary Sisters are present and work in Palestine, Israel, Jordan, Lebanon, Egypt, Syria, Arabian Gulf (Abu Dhabi, Sharjah) Kuwait and Rome.